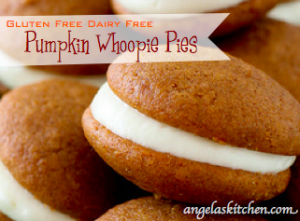 On the third day of Christmas my true love gave to me… Gluten Free Dairy Free Pumpkin Whoppies Pies with Maple Cream. You just gotta love such a great true love, am I right? This recipe uses my soft and spicy pumpkin cookies for the outer cake and a maple kissed marshmallow cream for the filling. 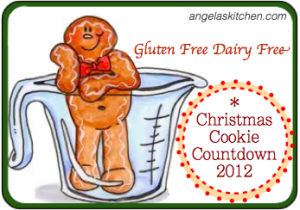 I will be making a double batch of these little beauties: one third will be packaged and frozen for Thanksgiving, one third for Christmas, and one third for Christmas gifts. Cream shortening and marshmallow fluff until smooth and fluffy. Add powdered sugar and maple syrup. Blend together, scraping down mixing bowl as needed until incorporated. Put about 2 teaspoons filling on the flat side of half of the pumpkin cookies. Top filling with another pumpkin cookie, sandwiching filling. Enjoy!